SkyTeam carrier Kenya Airways (in some cases with help of Air France-KLM) has released some great promotion between Amsterdam or Paris and beautiful Seychelles, dream holiday destination in an Indian Ocean! Return flights to Mahé available already for €394 incl. all taxes, meals and checked luggage. At this moment great availability throughout whole year 2019 except usual blackout dates around Christmas or Summer Holidays. Some of the flights may require longer layover in Nairobi on your way.. If interested look for flights from February to June or September to beginning of December 2019. Max stay 3 months. This promotion is kind of a flash sale..Discount is available only till 14th of February or until sold out..Below you can refer to our booking samples if interested in this solution to the Seychelles. Need some budget accommodation in the Seychelles you can use Booking.com. Hotels.com or Amoma. 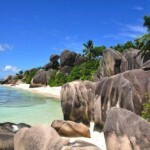 Booking sample of Cheap flights to beautiful Seychelles from Paris or Amsterdam from €394! In this case you would depart from Paris to Mahé on 8th of May. Return from this tropical archipelago in Africa back to Europe on 18th of May 2019.